Best San Pedro Oak Easel - This easel takes us way beyond the world of easels that we have known to date. Taking the best merits of the European Lyre and blending them with the best features of the American Studio Easel we present a marvelous new option for today's painters. Ideal for small, medium and large works in oil, acrylic and pastel. Wide painting tray features rubber grips to keep the canvas secure on a 30 inch x 4-1/2 inch utility shelf. Will hold canvasses up to 82 inches high. Adjusts to a variety of angles. Unique forward tilt for pastels ( note: must use a counter weight such as a cement block on the bottom shelf when adjusting with a forward tilt). Piano hinges at joints for maximum strength. Extended height 102 inches high, compacted height 63 inches high. Base width 35 inches, depth 27inches. Ships by truck. Each BEST Easel is made of American Oak, sanded to a smooth surface, then hand-rubbed with oil to reveal the inherent beauty of the wood grain. The craftsmen at BEST nail, glue, and wood screw every joint, guaranteeing strength and precision. Only the highest quality hardware is used as these easels are constructed to last a lifetime. 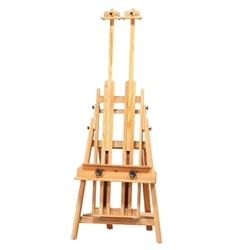 This easel can be shipped by truck for a $136.95 flat shipping fee. This offer applies to all 48 contiguous States. Hawaii and Alaska as well as international destinations require a separate quote. Ships partially assembled.